When Sarah finds something growing up from the ground, that looks like a pencil, she gets very curious and excited. Is it really just an ordinary pencil? This book was inspired by my children, and created with much love & joy. I believe that creativity stands in the base of human nature and we, the parents, should encourage our children to express their creativity every day. It is very important to me to hear what you think about it so please let me know by leaving a review. Your thoughts mean a lot to me. 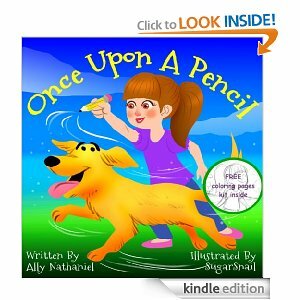 What a great little story and a bonus with free coloring pages. If you want your children to express more creativity then this story might get those juices flowing! My question for the author is does her parents get her a dog? My daughter is wondering but I keep telling her to decide the ending. I personally like this story because it teachers kids to love others like the love themselves.... a great biblical lesson that I was able to discuss more in detail.